Whale Wars Is whale meat popular in Japan? Whale meat sashimi is served at a whale meat eatery in Tokyo, Japan in May 2007. According to a recent Gallup poll, males 40 to 49 are the most likely to enjoy a piping hot plate of whale meat, followed by men between 50 and 59. Whale meat is still somewhat popular in Japan, but whether you like it or not depends largely on your demographic. According to a 2006 Gallup poll conducted by the Nippon Research Center and commissioned by Greenpeace, males 40 to 49 are the most likely to enjoy a piping hot plate of whale meat, followed by men between 50 and 59. The numbers aren't too surprising considering whale meat was served frequently in school lunches in the years following World War II, likely making it a sentimental favorite of children of that generation. If a man is in his 40s, there's an 11.6 percent chance he eats whale meat "sometimes." For men in their 50s, that likelihood drops to 7.4 percent. When it comes to females, however, poll participants between 30 and 39 years of age have acquired less of taste for the marine mammal. Not one answered "sometimes" when questioned about whether they ate whale meat, and only 10 percent said they ate the meat "very rarely." 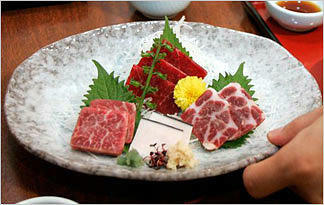 A whopping 21.7 percent reported that they had "never" eaten whale meat. When Gallup polled an even younger group -- females age 15 to 29 -- 51.3 said they had "never" eaten whale meat. A fourth option, "have not eaten in a long time" was the most common response. Females between 15 and 29 were still the lowest, coming in at 39.5 percent for this category, but the rest who answered affirmatively fell between 46.2 percent (males, 15 to 29) and 79.8 percent (females, 40 to 49). In fact, everyone above 30 answered "have not eaten in a long time" at least 57.1 percent of the time. All in all, some 95 percent of the 1,047 poll respondents reportedly ate whale meat very rarely, had not eaten whale meat in a long time, or ate it not at all. So while it might seem easy to assume how Japanese people feel about whaling in general, the poll results may surprise you. For example, 34.5 percent of the poll's participants thought commercial whaling should resume, and 39.2 percent "neither agreed nor disagreed" with the idea. With their taste for whale meat, males aged 40 to 49 were the most in favor of it (63.4 percent), while females 15 to 29 were the most opposed to it (47.4 percent). Females 30 to 39 ranked the most ambivalent to the idea (51.7 percent), while males 40 to 49 were the least ambivalent (only 29.6 percent) and the least likely to be against commercial whaling (10.7 percent). Other sources, such as the book East Asian Cultural and Historical Perspectives, show varying degrees of support. In a small study conducted in 1996, respondents overwhelmingly defended whaling as a cultural right. This finding contrasted with a 1991 Nippon Research Center study that found 64 percent of the respondents were against whaling, and 79 percent thought eating whale meat was not necessary. At least one Japanese scholar, namely Jun Morikawa of Rakuno Gakuen University in Sapporo, Japan, also disagrees that whaling is still as popular as some people claim. Instead, he thinks that whaling as a fishery, while important to some local Japanese cultural groups, lacks large-scale support at the national level. According to Morikawa, whaling's popularity is largely a myth promulgated by, among others, certain governmental bodies and major players within the whaling industry. It's hard to determine who's correct in all this, but one thing is for sure: Even with scientific catch limits downsizing the amount of whaling that's done each year, Japanese people don't always eat all the meat that's caught. According to the Guardian, of the 1,873 tons of whale meat processed in 2001, 70 tons went unsold.